Summer is here…or its supposed to be here and we all know its that time of the year when the legs come out that maybe not the case in Scotland right now. I wanted to share an awesome product with you that i found at Lush im loving it! 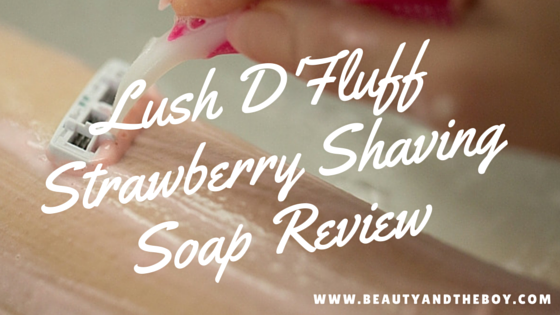 D’Fluff is a gorgeous smelling strawberry shaving soap, Its great because Lush has been missing something distinctly Strawberry scented in the range, i dont think ive seen much strawberry items. D’Fluff contains so many kind to skin ingredients such as fresh strawberries and cocoa butter to create a gorgeous bit of fluff that leaves you silky smooth, coconut oil, golden syrup, and egg whites to create a light texture that makes de-fluffing a dream. Dont ask me why but D’fluff reminds me so much of angel delight I have no idea why maybe its the texture although this is much thicker but once its warmed up it becomes a really smooth silky soap that your razor will just glides over. Say goodbye to irritated skin, Say goodbye to razor burn and ingrown hairs this little tub of magic will be the best thing you use shaving wise. What is your favourite shaving product? It does look like Angel Delight!! Way too tempting to eat instead of actually using it.